I was about ten when my mom bought a Science News subscription for the Tusk. Week after week the thin, frequent, small format publication filled my desk, and ultimately the floor of my room. The rush of science coverage came so quickly I sometimes felt guilty as a little guy for not reading every article. So, to an old fan, this recent exploration of the Younger Dryas Impact Hypothesis (YDIH) by Science News was personally interesting – and immediately disappointing. 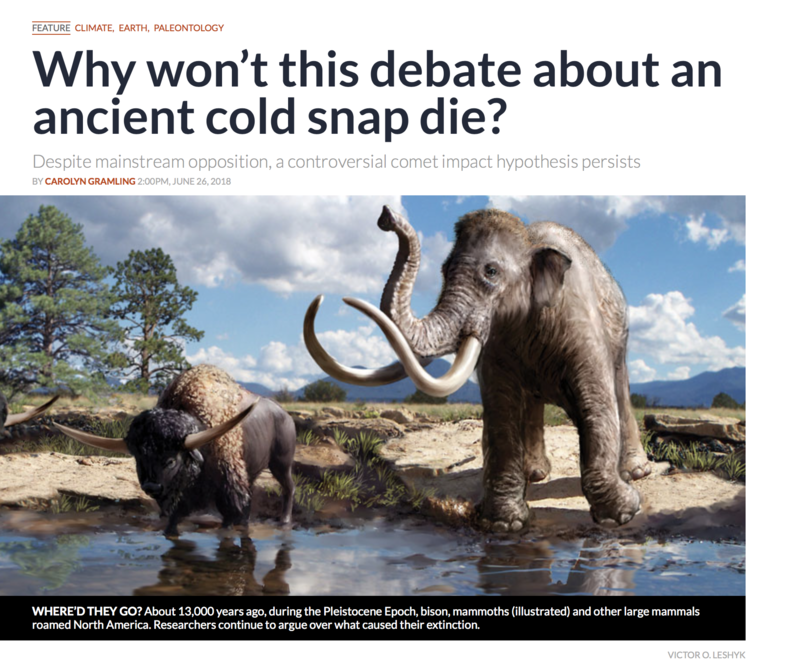 I read the headline, “Why won’t this debate about an ancient cold snap die?“and felt the dread of negative spin and anti-intellectual bias directed at our favorite idea. 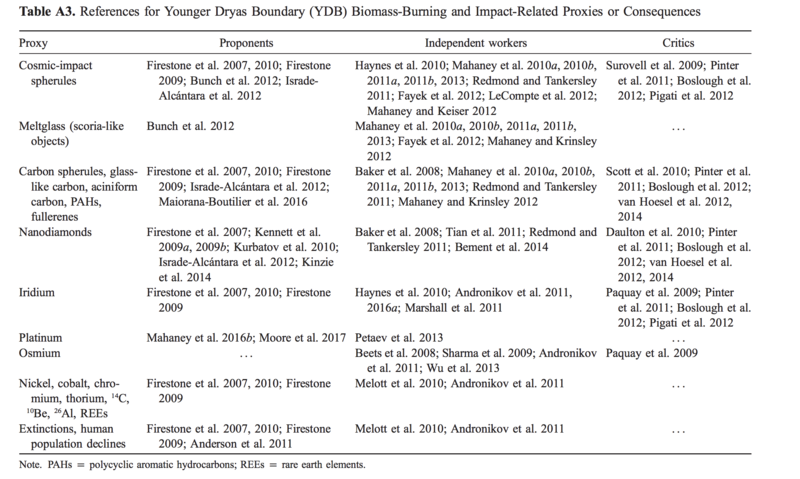 The approach repeated an anti-science meme begun in 2011 by an equally preposterous headline: “The Younger Dryas impact hypothesis: A Requiem.” The YDIH critics have always had a fascination with, shall we say, the “vitality” of the YD impact theory. For instance the childish tweets referring to the YIDH as a “Zombie” of science. However, since Science News has stooped to the level of questioning the ‘right-to-life’ for a published idea, lets explore the question. The Tusk takes the easy argument and posits that the debate concerning the Younger Dryas Impact has not died because the critical objections to the hypothesis (much less the attempts to kill it) have been comprehensively, repeatedly and satisfactorily answered in peer-reviewed literature authored by responsible experts in multiple relevant disciplines. The YDIH is alive because it has survived ten years of peer-review by presenting more and better field data refining a body of evidence for a globally significant cosmic impact in human times. Such a stupefying claim does not persist in the literature and gain co-authors, much less independent confirmations, without making a better and better case. It’s pretty simple: The much maligned peer review system is working. Gramling takes the more difficult path to an answer, ignores the possibility that science is at work, and sources only persistent critics with enormous stakes in the outcome of the YDIH. Clovis archeologist Vance Holiday, political scientist Mark Boslough, and Jennifer Marlon are sought out for their thoughts, unchanged for nearly a decade. All the same, Marlon understands the allure. “I have had pet theories, too. We are pattern-seekers. We tend to see things that look like a signal and so many times they’re not. A comet is simpler and more visually compelling — more appealing, in a way — than trying to sort out what Earthbound trigger might have caused such an abrupt climate change. Gramling allows Marlon to undermine the Scientific Method with a faddish reference to “pattern recognition” and a condescending challenge to the proponent’s powers of observation. At least seventy scientists, dozens of publications, independent confirmations, and hundreds of detailed graphs based on thousands of samples — they wave it all off as wishful thinking. How anti-science. I work some with the press, promoting the work of my company. This is just a guess but I suspect a regular critic freaked out when we published the two wonderful, comprehensive papers in March, reached out to Grambling to pitch themselves as ‘responsible critics of a wild theory,’ and two or three months later we see a weak attempt to call into question the scientific method. Whatever the cause of this misrepresentation, the Younger Dryas Impact Hypothesis is very much — and for good reason — ALIVE.